By Alan Green in VectorVest on 29th June 2017 . Countryside Properties plc (CSP.L) is a United Kingdom-based housebuilder and regeneration partner, primarily operating in London and the South East of England, and with a presence in the North West of England. Countryside operates through two divisions: Housebuilding and Partnerships. The Company’s Housebuilding division develops medium to larger-scale sites, providing private housing on private land, primarily around London and in the South East of England. The Housebuilding division operates under both the Countryside and Millgate brands. Its Partnerships division is engaged in medium to larger-scale urban regeneration of public sector land delivering private homes. The Partnerships division operates primarily in and around London and in the North West of England. The Company’s regeneration projects are developed in partnerships with public sector landowners, such as local authorities (LAs) and housing associations. Neil Woodford of Woodford Investment management is the largest shareholder owing nearly 10% of the company, closely followed by Aviva with 8%. All of the large well known asset management houses have a stake in the company, which has a market capitalization of 1.5 billion pounds. On VectorVest the share is valued at 488p, while trading at around 341p. This easily meets my criteria that the VectorVest valuation/price should be greater than 1.2. Earnings potential over a window of three years into the future (RV) is on an excellent 1.58 on a scale between o and 2, while earnings safety (RS) is good at 1.19. This is also graduated on a scale between 0 and 2 as are all metrics on VectorVest. In summary, the fundamental position of the company is in great shape. The trend and technical position is also in great shape, with a VectorVest calculated Relative Timing (RT) of 1.49, plus the share has been on a Buy recommendation since the start of April 2017. The chart of CSP is shown below using my normal notation. The VectorVest valuation is the green line study above the price, while earnings per share (EPS) is plotted by the blue line study in the window below the price. Over the last year, EPS has risen by 50% and this is the engine that’s driven the share price advance seen over the last three months. The company’s growth would seem far from over, as VectorVest calculates that earnings growth (GRT) will be 30% over the next year. On the 26th of May 2017 to the middle of June 2017, the share traded within what eagle-eyed technical analysts refer to as a “flag” formation. Over the last few days, the share would seem to have broken from this very bullish pattern and is attacking the 52 week high. The share is on a BUY and looks highly probable to move upwards from here. Remember, I speak of probabilities and not certainties. The overall UK market is still within a Confirmed Up signal. While the price of the VectorVest Composite has been rising, its momentum (MTI) and its breadth (Buy/Sell) ratio has been falling. This bearish divergence between the price of the VectorVest UK Composite and its momentum and breadth invariably precedes a turn, although the divergence can carry on for many months. The Primary Wave has been noisy and is also on a BUY as I write. The advice on the front page of VectorVest suggests caution, and that’s good advice. The pointer on the Color Guard is in the green. Summary. CSP looks highly probable for another advance. The share has a solid fundamental and technical outlook and is worthy of your consideration. The biggest danger to the prognosis would be a deterioration in the overall market direction. The latter needs to be carefully monitored on a day by day basis at this stage in the cycle. Although this share is suitable for my investment objectives, it may not be suitable for you. 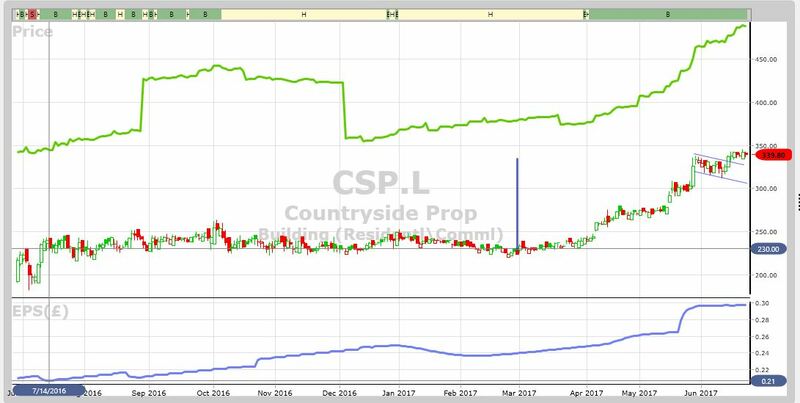 Readers can examine trading opportunities on CSP and a host of other similar stocks for a single payment of £5.95. This gives access to the VectorVest Risk Free 5-week trial, where members enjoy unlimited access to VectorVest UK & U.S., plus VectorVest University for on-demand strategies and training. Link here to view.